Data support of effective management of the process of development presupposes using modern methods of nuclear physics research in cased holes of the “old” well stock, as well as in newly drilled wells. These methods include methods of nuclear physics spectrometry, such as spectral pulse neutron gamma-ray logging, spectral gamma-ray logging, array pulse neutron logging in the integral modification. Employing a complex of nuclear physics methods (NPM) of well logging allows (even if initial geophysical section records are unavailable) to perform lithological partition of the section, to determine rock volume qualities and to evaluate the current saturation of reservoir formations through the casing column. Data thus acquired with a help of NPM is an important quantitative basis for creating multi-dimensional models of rock and pore space. Using additional data, such as GWL data on an open hole and trial data, help to make possible comparison of initial and current saturation figures and estimation of fluid inflow, which will accompany development of the sites. It is important to point out that the results of interpreting NPM data do not depend on fluid mineralization, therefore these methods may be used to evaluate the saturation rate of formations with low and unknown fluid mineralization, which usually presents a problem, sometimes an unsolvable one, for ordinary GWL methods. The use of NPM complex in long-developed fields helps to get more reliable data on the strata systems of fields under development, to discover additional oil production reserves and to create a modern information base for the effective management of the development process. Besides, data, acquired with a help of NPM, may be successfully used to solve the task of reserves estimation. 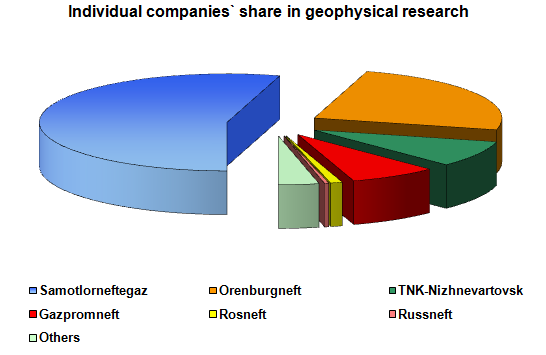 The success of NPM research is to a large extent conditioned by the complex technology employed by CJSC “NTC GEOTECHNOKIN”, by the hardware and software complex, provided by VNIIA, and by the techniques of interpreting the research results, obtained by NPC “Tvergeophysica”.